By definition, Pareidolia is a psychological phenomenon which makes your brain see vague or insignifigant stimulus as something significant. In other words, pareidolia is your brain’s way of making the unfamiliar or vague seem concrete, like when several bruise marks on a banana resemble Jesus, or thinking a cloud looks like George Clooney. Whatever the case might be, your brain creates these images of familiarity often, sometimes to a fault. For example, many ghost sightings have been blamed on pareidolia, in some shape or form. In this image, you can clearly see the outline of a ghostly looking man’s face, his long locks flowing behind. In fact, the face in and of itself is fairly Jesus-esque. But look a little closer and what you’re truly seeing emerges. 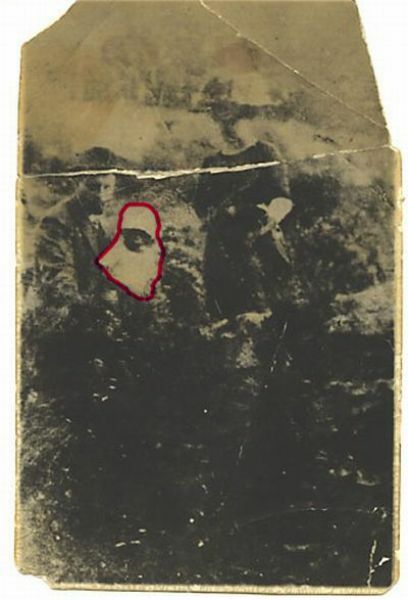 As you can see from the outline-aided image below, the picture is nothing more than a family portrait, the baby sitting calmly on its father’s lap. Because of the contrasting color’s between the baby and the bushes in the background, your brain automatically centered on the larger picture, which your mind perceived as a face. funny, i didn’t see it at first. I kept looking and looking and only after a few long moments did I finally notice the Jesus face. Now, it is hard to not see the Jesus face….